Description: This huge wooden white cross loudly advertises the spot of Tanya's demise. Mounted on a steel pole, this sturdy cross has a base of rocks and fake flowers. A single battered shoe, presumably the victim's, lies at the foot of the cross. Analysis: This roadside memorial is a trip. It's so big, you can't possibly miss it as you cruise up Hwy. 395. 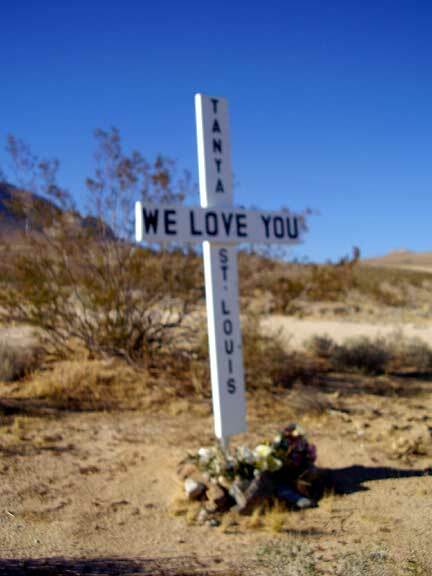 With bold black letters proclaiming their love, Tanya's family really want people to know what happened here. The other bizarre thing is the shoe. It is completely trashed, and you have to wonder if the victim was wearing it when she crashed. As for the accident itself, poor Tanya was probably t-boned at the intersection by some drunk driver.